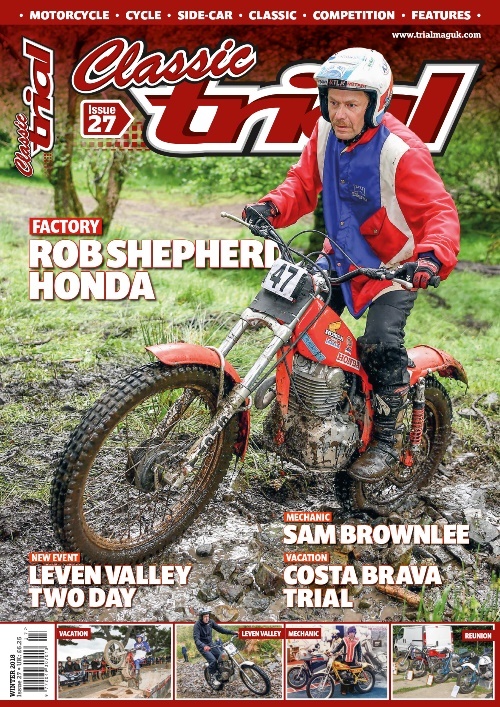 CLASSIC TRIAL MAGAZINE ISSUE 27 – TIME FOR A BREW! It’s that time again for all the subscribers to Classic Trial Magazine, Issue 27 should be dropping through your letterbox early this week and inside you will find all your Classic Trials News, Action, Events, Tests and so much more for you Classic – Retro addicted trials enthusiasts. It’s time for a brew a beer or maybe a wine for the ladies so park your feet up sit back and enjoy the read! Factory Special: Restoration of the Ex-Rob Shepherd Honda 360. New Event: The Leven Valley Two Day in Scotland proved a winner for everyone involved including Classic Trial Magazine. Mechanic: Find out about the Mick Andrews apprentice Sam Brownlee. Flashback North: It was a cold and wet 1968 Bemrose Trophy Trial. Conversion: One man’s passion for the Honda TLR 250.
International: It’s on the ‘Bucket’ list, the Robregordo Trial in Spain. Vacation: Attracting nearly 500 riders the Costa Brava Two Day Trial was the place to be despite the rain in Spain. Reunion: A gathering to reflect on the Perce Simon Trial. Flashback: Ice and cold came to the 1968 Cotswold Cup. Product Feature: Wrapping is a fast and effective protection, find out more. Sport: Once again the Kia Championship has proved a huge success. Christmas Gift Ideas For Everyone!